Quartz is one of the most abundant minerals in the earth’s crust, second only to feldspar (used as the abrasive component in household cleaners). While raw quartz has many applications ranging from optics to timekeeping, these stones are rarely used as building materials. Instead, most contractors use engineered quartz slabs as a cheaper, more durable, and customizable alternative to natural stones such as granite, marble, and limestone. Engineered quartz is synthesized from a composite of raw, ground quartz (90-95%) and resins, polymers, and pigments (5-10%). This creates the perfect compromise between the durability and beauty of natural stone with the versatility and price of laminate countertops. Depending on how coarsely or finely your quartz is ground, this method can produce a smooth lime- or soapstone appearance, or a coarse, granite-like appearance with flecks of color and gemstones. What Are The Benefits of Engineered Quartz? Compared to granite, this quartz composite is even stronger and long-lasting. For this reason, many contractors will provide guarantees you won’t find with other countertop materials. And because the polymers used to bind the ground quartz are sealed and impervious to household chemicals, you don’t need to polish or seal engineered quartz. Being non-porous means they are easy to keep 99.9% bacteria free! The only drawback is that is it somewhat susceptible to heat, so trivets and heating pads are recommended for homeowners with quartz countertops. Another advantage is customizability. Where natural stone styles and colors are limited to what is found in nature, you can custom order quartz countertops to be fabricated in any color you can think of. Many customers even select quartz that is designed to look like their favorite granite, since the look is indistinguishable and the price point is so much better. Quartz countertops have become increasingly popular in the last decade, as demand for natural stone countertops has driven their prices to astronomical levels. 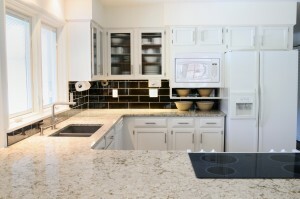 Nevertheless, quartz countertops remain one of the best-kept secrets in home renovation. If you are looking for a quartz countertop installed in your Chicago or Chicagoland home, contact Granite Selection for a consultation and quote!